For today's SFR (Science Fiction Romance) Brigade Presents snippet I took a chance to write down a scene that's been playing in my mind for the last few days. It seems that there is going to be another book in the barren planet's romance series after all. This one follows Kerit, Tyris's brother. And I'm not going to say anything more than that, for fear of spoilers on how Reckless Rebellion ends. But I can share the beginning of this book with you. Need to do a LOT more research yet, to see how this holds together, but for now, it's out of my head (I hope), so I can get on with finishing Reckless Rebellion! Kerit jammed his foot against a rock, and reached into the chalk bag hanging on his belt to coat his hands. While he was stopped, he took a swig of water, and stared up at the cliff above him. Hopefully he would find more handholds above him. Picking a path up the steep rock face wasn’t easy when he could only see about twenty feet ahead of him through the thick dust. He clipped the bottle back onto his belt, and reached for the next crack in the rock, testing each spot carefully before he committed his full weight to it. The dust just helped the rest of the world, and the spaceship somewhere below him, fade into the distance, as he focused solely on the climb. Ahead of him there was a change in the cliff, hopefully a ledge. If it was stable, he could stop and rest for a few minutes. He still had several hours of climbing to go before he reached the point where he could place the beacon he carried in his backpack. 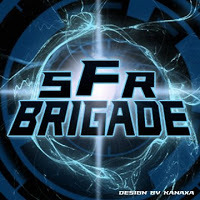 SFR Brigade Presents are a snippets from a group of Sci-Fi Romance authors. Check them out to discover other cool snippets. Congratulations! I liked the sample I read on Reckless Rescue–made me want to read more. And thanks for your comments on my last couple of blog posts. They meant a lot to me. Thanks Marjorie. Glad to hear you enjoyed it, and I enjoy visiting your blog.